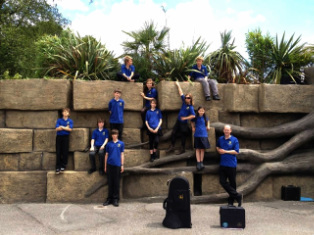 The Learner Band meets once a week during school term time on a Friday at 6pm. The Band is taken by Steve Ellis, CoBBB's principal cornet. He is a professional music teacher and has all the skills to teach young (and old) people to learn how to play a brass instrument. Anybody who can play an octave is welcome to come along. If you are interested in the Training Band for yourself or your child, please come down on a Friday to experience the fun in a relaxed environment. Alternatively, if you want information before you come down, contact us by using the contact form. I just wanted to say a huge THANK YOU! For your fantastic generosity in all coming along to play so beautifully for us all on Saturday. Having you there greatly added to the sense of occasion. I do hope you will be able to play at the event next year too. Everybody that I spoke to said how wonderful it was to have the Learner Brass Band playing and how accomplished they sounded. 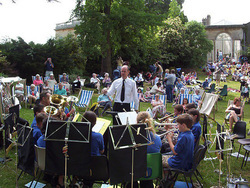 Thank you very much for coming along to St Bon's today with the Bristol Learner Band. They were great and we all really enjoyed listening to them. Again thank you so much for bringing the band on Saturday! You guys were fantastic! Everyone loved it and people who heard you before they saw you couldn't believe the band was so young and yet so talented! I'm sorry if the hectic busy day meant that you didn't all mange to get free cake and drinks - I forgot to check/remind you that you were due them.